“Perception is Projection” – really? How to change limiting beliefs 2: What’s the real issue here? Want to learn more about how to use NLP in the real world? Get inspired with Practical NLP Tips - techniques, insights and patterns you can use straight away, emailed to your inbox. I’ll also send you my Practical NLP audiobook FREE to thank you for subscribing! Are you an NLP trainer? Save huge amounts of time designing your courses! 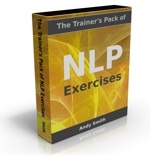 Download The Trainer's Pack of NLP Exercises now!